California, along with the entire Western United States, is in the midst of a historic drought. Areas with relatively plentiful water watch helplessly as densely populated areas drain shared water sources with reckless abandon. A large population center in a dry area can consume water from surrounding watersheds because all the resources within the state may be directed wherever the people will it to go, and political power is concentrated in the populated areas. Therefore, people who live in rural areas with relatively plentiful water supplies can be overpowered by the will of thirsty city inhabitants. 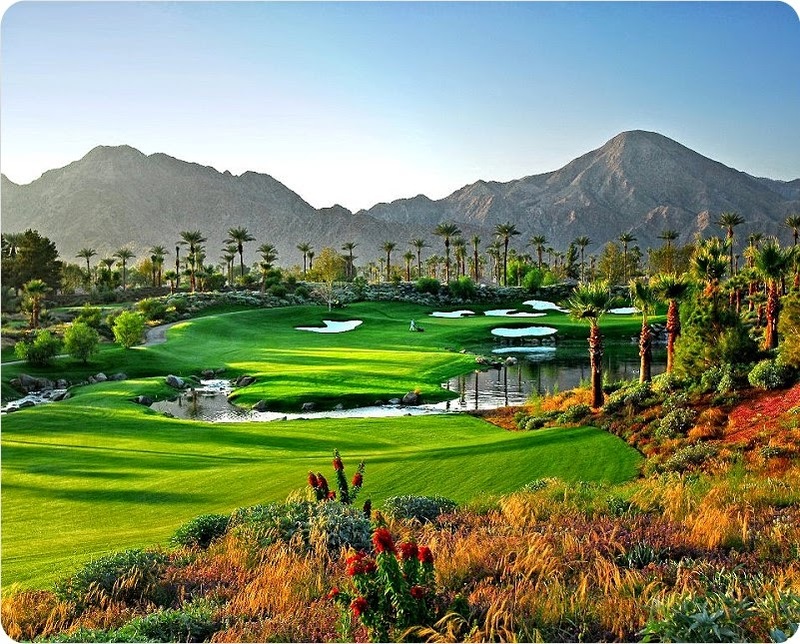 A golf course in Palm Springs Desert irrigated with water from Northern California and Colorado. Let's look at California as an example. Political power in this state in concentrated in large coastal cities such as San Francisco and Los Angeles. These cities do not have enough water to sustain themselves, but because political power is concentrated in their populations, they can overpower the will of residents in neighboring watersheds to demand access to water. This is why Los Angeles enjoys a steady stream of water from Northern California's Sierra Nevada mountains. The residents of these mountains do not have the political clout to rebuke Los Angeles' demands. But what if residents of an area did have the ability to decide how to use their own water? What if each watershed was an independent state, in charge of managing it's own water resources. Many cities would find themselves separated from their water sources by watershed boundaries. San Francisco and Los Angeles, no longer in control of water from neighboring watersheds, would only be entitled to the water which neighboring watershed states agreed to provide. This is not a new idea. 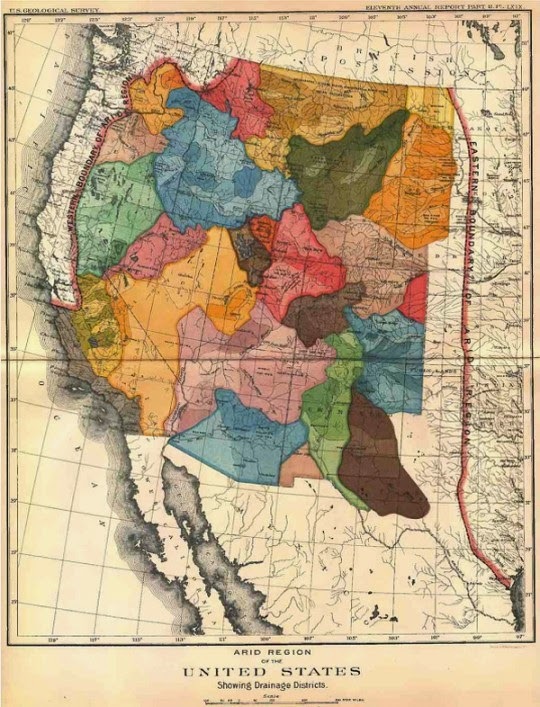 In the late 1800s, director of the USGS John Wesley Powell suggested the idea of determining the boundaries of western states based on watersheds. His idea was that each region would be responsible for their own water, and would not be forced to supply water to another region involuntarily. In this scenario, Los Angeles would be powerless to override the will of water-rich northern Sierra residents as their political institutions would be distinct instead of combined into one state. Powell's map of States based on watersheds. Above is a map of Powell's state boundaries based on watershed. Notice that coastal California would be politically separated from it's primary water sources, the Sierra Nevada mountains and the Colorado River. No longer would residents be able to force those living in other water sheds to give up their local water supply. Perhaps than residents of desert areas would understand just how precious clean, clear water is to the American way of life if they didn't not have unlimited access to water from other regions. When we bring the water to where we want to live, those who live where the water is are deprived of their right to enjoy their local resources. Political clout is removed from the environmental impact of resource management choices made by thirsty urban centers. The end result is that the biggest consumers of water in the west don't know where their water comes from, and this water has often traveled thousands of miles through many watersheds to reach an end user. Look at the map above - clearly, none of Powell's recommendations were adopted. Those who live near potable water are doomed for the foreseeable future to provide water to the dry cities of the west and desert southwest. Hopefully better management techniques will be implemented before the water runs out all together. I am a map nerd. I love gadgets. Using the two together is even better! Professionally, I manage Location Based Products and Services, specializing in Geofencing and Cell Network Location. Outdoor enthusiast, technology lover, always looking for a new place to explore! Search for my name to follow my adventures on Foursquare and follow me on twitter(@vairuh) for my narration!